Even if you aren’t a whiz in the kitchen or particularly health conscious, finding a pan that works well for a reasonable price is always exciting. If you’ve seen the Red Copper pan reviews on TV, you might be wondering if they work as well as they claim. As a consumer, you take every infomercial and “As Seen on TV” product with a grain of salt. We certainly do. Red Copper pan reviews are relatively mixed, but today we’re going to lay out the facts for you below. We have scoured through customer reviews and testimonials to find you the most reliable information on the market. We’ve also sought a wide array of data about these pans to determine if they are a good value for their cost. If you got intrigued by these magical pans, keep reading to find whether the Red Copper Square Pan is a worthwhile investment. What is the Red Copper Square Pan and How Does it Work? One of the easiest, quickest, and most commonly used ways of cooking is frying. Many people state that their frying pan is possibly the most utilized piece of any cookware set in their kitchen. For that reason, it has become standard for people to replace their pans after a few years or even months of usage. The Red Copper Square Dance Pan guarantees to change all of that. With its unique combination of copper and ceramic coating, the pan heats up more efficiently compared to other choices that are available on the market. It enables you to produce healthy and delicious meals with less oil for a shorter period. The pan also highlights an optimally designed bolted handle that does not conduct heat so you can grip the pan straight from the oven without getting burned. The capacity and form of the pan are also worth recognizing. The wide surface area and the square shaped surface make it likely for users to include more ingredients any time they want. The pan can also be utilized for baking and roasting, with its high-temperature capacity of up to 500 degrees Fahrenheit. Dynamic, elegant, and simple, the Red Copper cookware is changing the way people fry. Allows a variety of other purposes and cooking styles, this superior frying pan will undoubtedly find a worthy spot in your kitchen for you to use and appreciate many times and for many years. The Red Copper Square Pan is one of many pans included in a set of ceramic coated copper pans. American cookbook author Cathy Mitchell endorses the Red Copper line of cookware.If you are familiar with her infomercials, you know that these pans boast a superb nonstick coating and effortless cleanup.All the Red Copper Pans have a home on TV infomercials, but today we are looking at the “Square Pan," to learn more about its extraordinary claims. The “Square Pan” is the largest pan in the Red Copper line. It features 4-inch high sides and a massive 10- by a 10-inch base. This pan boasts excellent versatility and durability. ​How to Use the Red Copper Pan? ​Wash your Copper Chef pan with soap and water, and let dry completely. The manufacturer does not include this particular step in the seasoning procedures but we like to give anything that is brand new a quick wash to remove harmful chemicals and get anything unsavory off that may have seasoning been left on from production and packaging. ​Once fully dried, apply a light coat of vegetable oil. You can also use coconut, avocado or flax oil on the whole inner surface of the pan by using a paper towel or a kitchen rag. ​Use oven mitts to remove the frying pan and let it cool down on its own entirely. ​Wipe away any remaining oil, and you are good to start frying! ​How to Clean the Red Copper Pan? ​If you care for your pan properly, cleaning it is easy and should be very quick. Generally, you can use a paper towel to instantly wipe out any food remnants which is just like the infomercial; it is ultimately dishwasher safe. If you do have a little tougher mess to remove, it is best to never use steel wool or any other rough and harsh scouring pads. You can handily use a paper towel or a washcloth. Another significant thing to avoid is to either pour water on or submerge a hot pan in cold water. The rapid cooling from high-temperature can warp the surface or create other cracks and imperfections that will destroy the finish. The manufacturer suggests that you can clean the pan in the dishwasher, or use warm soapy water to clean the pan. It makes it an awesome low maintenance product for many users. But overall, it is still best recommended to prevent using soap or the dishwasher to wash your red copper pan, similar to the way you care for any cast iron pans. You want some of the remaining oil that has soaked in just below the cooking surface to support in the non-stickiness of it. Even a surface that seems flat to the human eye or touch is not on a microscopic level. The oil fills all of those spaces making it truly non-stick. If not washed with soap for some reason, it is not really a big deal; however, it is an excellent idea to re-season the pan in that case. ​What Makes the Red Copper Square Pan Unique? ​​A variety of features make the Red Copper Square Pan a unique find. ​This simple cooking pan is the replacement for several pieces of specialty cookware, and a kitchen space saver. ​Red Copper pan reviews claim that this pan is good for baking, broiling, steaming, frying, roasting, sauteing, braising, and deep frying with ease. ​This distinctive square pan is made of copper-infused ceramic. It is oven safe up to 500 degrees Fahrenheit and sold with a few accessories to support different cooking methods. ​Also, the nonstick surface is free from the PFOAs and PFTEs present in conventional nonstick pans. 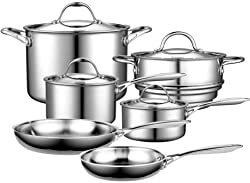 ​Red Copper Pan is Perfluorooctanoic Acid (PFOA) or Polytetrafluoroethylene (PTFE) free. PFOA is a substance used in the process of making PTFE, a chemical which produces a non-stick surface. PFOA is a chemical formerly used in the production of DuPont Teflon and other non-stick ceramic coatings. It was recommended for discontinuation by the United States Environmental Protection Agency (EPA) after studies exposed it causes developmental and other harmful effects in laboratory animals. PTFE does not pose health matters unless made from PFOA. PTFE remains to be produced safely and still available in the market. As mentioned above the square pan comes with a few accessories. For steaming and roasting applications, a rack comes standard. Additionally, a wire basket comes included in the set for deep frying. Like many pans, the Red Copper Square Pan bundle has a tempered glass lid. In addition to the pan and its accessories, consumers will also find a small cookbook as part of their Red Copper bundle. Cathy Mitchell authors the recipe guide. Red copper pan reviews show that the cookbook is somewhat limited, but that the recipes are well designed and tasty. The most appealing feature of the Red Copper line of cookware is the impressive nonstick surface. ​In their infomercials and sales pages, Red Copper claims that there is no need for oil, butter or fat to keep food from sticking to their cooking surfaces. ​As a bonus, this same cooking surface makes cleaning up almost effortless. ​Despite the claims that there is no need for oil or fat to take advantage of the Square Pan’s nonstick qualities, Red Copper recommends that you use oil or grease to season the pan regularly. ​While this may seem shocking, the same method will keep the surface of cast iron pans nonstick and ready for cooking. Arguably the most exciting feature of the Red Copper Square Pan is that it is copper-made. Because of its high price point and a few health hazards, 100% copper pans are not a common sight in busy kitchens. ​It’s important to note here that the health hazards associated with pure copper pans are not inherently present in the Red Copper line of cookware. ​Copper naturally reacts with acidic foods like tomatoes causing copper to leach into your diet. However, exposing yourself to the metal leaching on a regular basis will present a significant danger. ​Blended into the lower levels of ceramic the copper in these pans is under the nonstick coating. This feature ensures that the food you cook in these pans does not come into direct contact with the copper. ​But, if your pan becomes scratched or damaged, it is possible that your food could potentially react with the copper in the container. If copper cookware sets seem fancy for you, you may want to check out other options like the classic stainless steel set, hard-anodized, and the non-stick ceramic sets. ​Like many “As Seen on TV” products, the pricing for the Red Copper Square Pan is relatively consistent regardless of where you bought it. ​The Square Pan comes in a set with a few accessories and a small cookbook. This five-piece set costs for around $40. A lot of the cookware sets, like the Copper Chef XL that we recently reviewed, comes with a cookbook. This will motivate you to use your new kitchen set. ​Depending on how and where you buy the bundle, you may or may not pay shipping fees. ​From what we can tell the five-piece set is the only option for buying this pan. The Square Pan is its own the “specialty” line and as such is not available in any of the other Red Copper sets. Many people are afraid that these pans are a scam because this pan comes from an “As Seen on TV” brand scam. However, after scouring through customer reviews and testimonials, we found that most consumers have a positive experience using the Red Copper Square Pan. ​Generally speaking, the Red Copper Square Pan performs as expected. It provides a broad cooking surface and an excellent non-stick surface. ​As mentioned above, we recommend periodic seasoning to maintain the nonstick qualities of this pan. ​Customers report that following the included guidelines for using this product, results are excellent. ​Most customers love the fact that this pan cleans up good. Many users report only needing to wipe out their pan with a soft cloth after using it. ​The nonstick coating is useful and keeps food from sticking regardless of how you use it. ​Also, customers love the low price of this five-piece set. Because this pan is very versatile in, many customers feel that this product provides excellent value and convenience. There are two sides to every story. While most customers love the ease and convenience they experience when using the Red Copper Square Pan; others feel this pan is overrated. ​Also, for buyers needing help, customer service for this product is lacking. While negative red copper pan reviews are relatively sparse, there are a few complaints. ​The most common complaint about the Red Copper Square Pan involved the exterior red paint. ​Some users reported that the exterior color would come off of the pan and transfer to their cooking surface. This problem primarily occurred on flat cooktops. ​Aside from the exterior paint, customers have also noted that the pan did not sit flat on their cooktop. Again, this primarily affected users with flat top ranges. ​The final complaint customers had about the Red Copper Square Pan was on the nonstick surface. Some users feel that the nonstick coating is not nearly as durable as advertised. ​However, it is worth noting that the user guide does recommend using plastic or wooden utensils to preserve the pan’s finish. The cookware tips that we mentioned here might come handy. 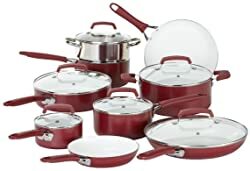 ​​Despite being suspect to the negative reputation of “As Seen on TV” products, most people seem to enjoy owning the Red Copper pans. ​While the pans do require more maintenance than their infomercials imply, many customers find that these pans still provide an excellent value for their cost. ​Also, this pan includes a lifetime warranty should you need it. However, customers have reported difficulties when working with Red Copper’s customer service department. ​In particular, it can be time-consuming and challenging to get the company to send your replacement pan. However, most customers did not need to use the included warranty. ​Negative reviews were few and far between which gives us more confidence in the quality of this product. ​In general, people are more likely to provide a review for a product or service if they have had a bad experience. 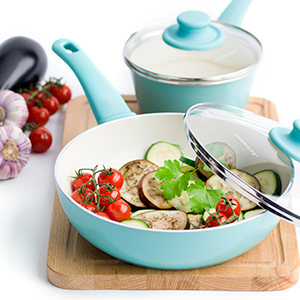 ​The plethora of good reviews speaks volumes about the positive experiences that people have using these pans. ​​So, how does the Red Copper Square Pan compare to other cookware on the market today? Generally speaking, this product compares well with other similar products. ​Ceramic coated copper pans have become a bit of a hot ticket item lately, and all of them provide similar features. ​For the price that you’ll pay to buy the Red Copper Square Pan, you are getting a good quality pan that will work at least as well as other ceramic coated copper pans on the market if not better. ​Conversely, one competitor, the Copper Chef line, does provide a similar pan that has a higher heat rating and supports induction cooking. 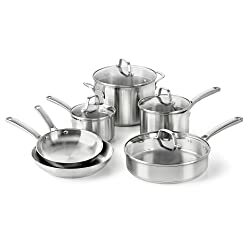 ​But, the Copper Chef pans are typically a little more expensive. Also, some customers have reported that the Copper Chef line is not as nonstick as the Red Copper line. ​When compared to other nonstick pans, the Red Copper Square Pan seems to perform quite well. Many people cook the stickiest of foods with no problems in this pan. ​The same is not true for every nonstick cookware brand on the market today. ​Compared to a traditional cast iron dutch oven, this pan is very similar. They are both oven safe, usable for a wide variety of applications, and need a small amount of regular maintenance. ​The main benefit you will get from this pan is the square cooking surface, the included accessories, and the lightweight design. The Red Copper Square Pan is a good fit for consumers looking for a large, versatile, nonstick pan. The price is not outrageous, and customer reviews support our opinion that this is a decent piece of cookware. ​The added accessories and cookbook sweeten the deal for buyers interested in using every feature of the pan. ​On the other hand, there isn’t much this pan can offer that you can’t find in other cookware. ​In fact, purchasing and maintaining a large cast iron dutch oven will provide many of the same benefits. Although, the Red Copper pan will be much lighter weight. Overall, as per Red Copper pan reviews, consumers must look carefully at what they want to get out of any piece of cookware they buy. You know that, or you wouldn’t be here reading this review. While this pan is not what we would call “top of the line," it will get the job done and for a reasonable price at that. For users that cook frequently, this pan could quickly become a blessing or a curse. It will be necessary to treat this pan with care if you want it to last. Also, if you only cook small meals, this pan may not be a good fit for you. Indeed, you can prepare small portions in this pan, but also you can save money by purchasing a smaller vessel. Because this pan doesn’t contain some of the chemicals found in other nonstick pans, the Red Copper Square Pan is an excellent fit for those trying to minimize chemical exposure. However, keep in mind that you will need to replace this pan if the coating becomes damaged to avoid copper exposure. Overall, as other Red Copper Pan reviews suggest, this pan is a decent addition to most kitchens. The price is moderate considering what all included pieces in the set. The Red Copper Square Pan provides incredible functionality and versatility. Should You Buy A Copper Chef XL?